Curators of Sweden is one of Sweden's official Twitter accounts. Every week, someone new manages the @Sweden account and over the course of seven days tweets about life in Sweden and shares views and ideas along the way. A new Swede then takes over and does the same thing – but of course differently. 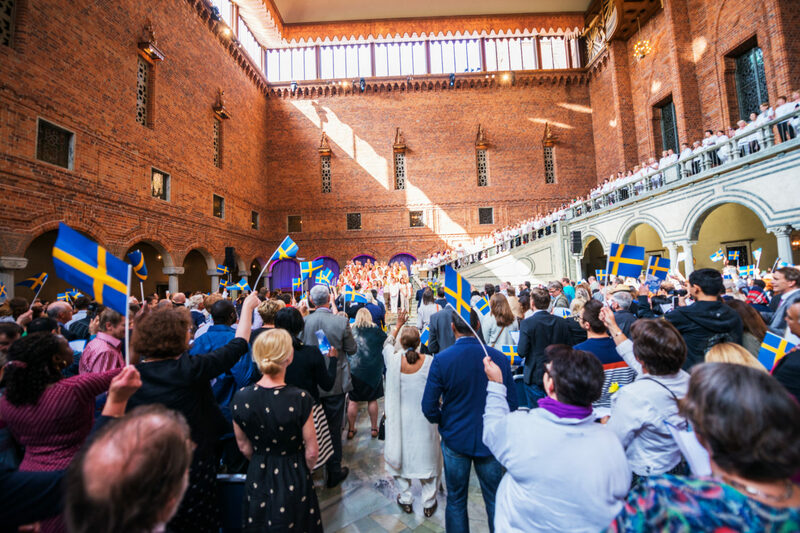 The idea behind Curators of Sweden is to interpret our country via ordinary citizens whose voices might not otherwise be heard in the general discussion about Sweden. So what’s it like to be Sweden’s official Twitter voice for a week? We asked a former curator to describe his experience. Max Karlsson was a curator in February 2017 and took over the account at the time of Donald Trump’s statement about “Last night in Sweden”. Max was dragged into a Twitter storm and became a focus of widespread media attention. As Sweden, what were the first few days like for you during this intensive period? – Trump made his comment two days before I took over the account. I quickly decided that this was a chance to be a mouthpiece for facts. I used facts and humour to provide a true but balanced picture amidst all the uproar that his statement caused. – Before taking over the account I had a pretty clear idea of what the task involved, but there was no way I could have prepared myself for that development. I had to be more active than I’d planned, for instance, as there were questions to be answered and information to be checked constantly. I could have worked round-the-clock. – I had to back off occasionally during the week, so as to stand the pace. I needed food and sleep just like always, of course, and I needed to chat with friends, spend time with my partner and things like that. But I do think it can be difficult to set limits when you’re in this role. I’m good at that, at structuring things and working under pressure, so it wasn’t so bad in my case. But someone who perhaps hadn’t the same experience of being active on social media might have found it less easy. The editors at SI asked me if I needed support in some form, but I didn’t think I did, although perhaps some kind of support function might have been useful. Before you took over the account, what did you know? – I knew that the account was run by an ordinary Swedish citizen for a week and that it was then passed on. I’d heard about this initiative as it attracted a lot of attention when it was launched. The idea of having a country account was completely new. – During my time as curator I’d planned to talk about myself, my interests and what’s good and bad about Sweden, in an amusing way. And how did you deal with the international media storm that you suddenly found yourself plunged into? – It was surreal! I was quoted in 60–70 different media during this period and gave 20–30 interviews. The phone never stopped ringing. The Independent did a personal interview and I was mentioned in The Verge, The Hill and many other prominent media. The Washington Post ran a live stream with me from my own kitchen. They asked me if I wanted to do it late in the evening and the live stream went out at 1 o’clock at night. I lay down for a while to rest and then changed into a shirt and sat at the kitchen table, but with my pyjama bottoms still on. The broadcast was seen live by 70,000 people around the world and a total of 100,000 saw it afterwards. How did you handle praise and criticism during your week at the helm? – 99% of those who interacted with the account during this time were pleasant, friendly and curious about Sweden, including those who perhaps didn’t agree with what I said. I tried to make it clear that it was facts I was publishing and not so much opinions. I was active and open and replied to all the tweets, unless they involved direct threats. – But yes, there were trolls, hate and abuse. I blocked a lot, and muted people, but only if they were threatening or on a power trip. In general, it’s a good idea not to interact with trolls since that simply gives them fresh fuel. Certainly there was some of that, but it wasn’t so serious that I couldn’t handle it. If I’d needed support, of course, I could have contacted SI. – It was also important for me not to adopt a particular style but to be very much myself. When I didn’t know something, I made this clear, I showed that I didn’t possess the absolute truths about things. When people got personal sometimes, I said things like “this doesn’t feel okay” or “I feel that…” because I wanted them to understand I was just an ordinary person. And there was in fact some interest in me as a person, which showed for instance when I was allowed to follow up the live stream with an article I wrote for the Washington Post. – Yes, absolutely! It would be fun to talk about what happened behind the scenes during that week, and all the great interaction. I think too about what I’d say if I had that platform again. It’s a really unique opportunity to get your message across. What do you think about this type of curating? – Great! This platform makes it possible to tell about our country in an honest way, with many different voices and aspects that make for a balanced picture. And how do you feel about the choice of curators? – If there are reactions, this doesn’t necessarily mean something’s gone wrong. Surely the whole idea is that it differs from week to week. No-one can be interesting for everyone. But followers may find it difficult to see another person’s perspective and may react immediately when someone isn’t like what they had in mind. Do you think the account has a future? – I think it has a unique position, and many other countries have followed suit, such as Norway, Italy and several cities in the US. I believe that @Sweden is still relevant, but of course you need to think about the right way to do it. Has your experience as a curator affected your presence on social media? – Yes, absolutely. I got a lot of exposure during this period, but later as well. When it was still unclear what had happened during the terrorist attack in Stockholm in April, two Australian media phoned – they still had my contact details. Presumably because they felt I had credibility in discussing similar matters. The situation was very different then, of course, but I took the same approach: facts matter – don’t speculate! – As a result of the curating assignment, I’ve had the chance to develop my own writing. Now I think more about what I’ve got to say and the fact that it can influence people. What was your last tweet as Sweden?